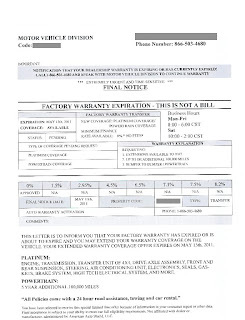 A while back, I posted about vehicle warranty companies that mail "urgent" notices warning you that your automobile factory warranty is about to expire, and that you need to renew it right away. It appears that these auto warranty companies scrape information from vehicle registration public records to make their sales pitch. 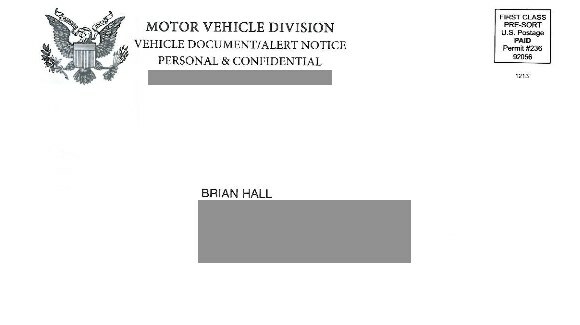 I just wanted to share this new and improved notice from MOTOR VEHICLE DIVISION (866-503-4680), complete with an official eagle crest, and the warning "Notification that your dealership warranty is expiring or has currently expired! Extremely urgent and time sensitive - FINAL NOTICE." Interestingly, this one states at the bottom, "Not affiliated with dealer or manufacturer, administered by American Auto Shield, LLC." It's nice to see a little more disclosure on these somewhat deceptive notices before they make their way to the shredder. What amazes me is how many final notices I get. I always thought once I got the final notice I would stop getting more notices. Guess that's not the case. If you get this letter, know that it is a SCAM. I called the 866 503-4680 number. They will tell you whatever you want to hear. They told me I had no factory warranty and that they provided the best coverage. Don't fall victim to their scare tactics. I found the ACWII and they set me straight. I got a factory plan for 1000$ less than the dealer quoted and I can have my car fixed by my regular mechanic. Anything on a post card other than vacation pictures just looks hokey! I just got this same notice. Perhaps Ira Glass, of This American Life would enjoy exposing this scam. Hmmm. I got one too! Oh yeah, and I had just purchased this car less than three weeks ago. 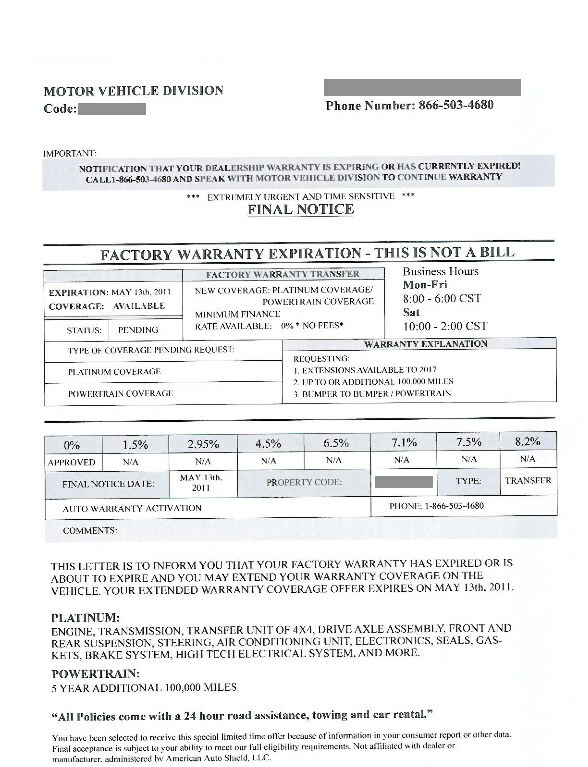 It is a 2010 model, so it still has some of the factory 3/36 left BEFORE the Certified Pre-Owned Chrysler warranty kicks in for 7 yrs. or 100K miles. Do these guys think we are all stupid? How *do* they find out about our vehicle purchases anyway? I had bought a car like two months back and I received this scam today.